I first saw the Scott Foil when a pre-production version was rolled out during the 2010 Tour de France. It was a bike that promised all the benefits of an aero frame without compromise, and at that point, I knew I wanted one. However, there was just one problem: I was young, working two jobs and trying to earn my college degree. There was simply no room left in my wallet to find that bike a home in my garage. A few years later, with a new job at a bike shop (and thanks to my employee purchase price), I had saved up enough cash to purchase a 2013 Scott Foil 20. The bike featured a full Ultegra mechanical build kit, along with a host of top-level Syncros parts. My new ride was a game-changer during every elbow-rubbing crit or soul-crushing century I entered. Its unique aero shape, ultra-stiff ride and race-ready geometry set this bike apart from anything else I had previously ridden. Eventually, all my pedaling and writing would land me a job at RBA’s sister publication Mountain Bike Action, where I’ve now been pounding on the keys for the past three years. In all this time, wide handlebars, dropper seat posts and plush suspension have been my focus—until I spotted the 2018 Foil Disc sitting in RBA’s office. Before I knew it, I was “foiled” again. 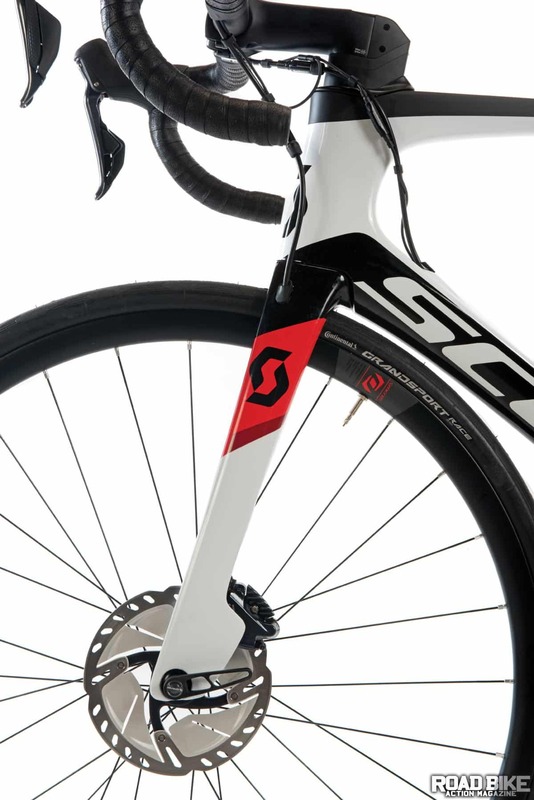 In an effort to balance weight savings, stiffness and aerodynamics, Scott engineers developed the Foil’s frame with a unique airfoil shape. By cutting off the trailing edge of a traditional aero-shaped tube, Scott was able to increase performance while retaining the same aerodynamic advantages. The 2018 Foil builds off its original frame shape while introducing an all-new fork and rear triangle. The fork was redesigned to handle the asymmetrical forces of disc brakes and uses a 12mm thru-axle with an oversized 25mm head. This larger head is said to increase the contact surface between the fork and the axle in order to handle the extra load caused by the front disc brake. Scott then added an aerodynamic fin to cover the brake caliper, along with internal cable routing. Scott claims the fork can accommodate tires as wide as 30mm. 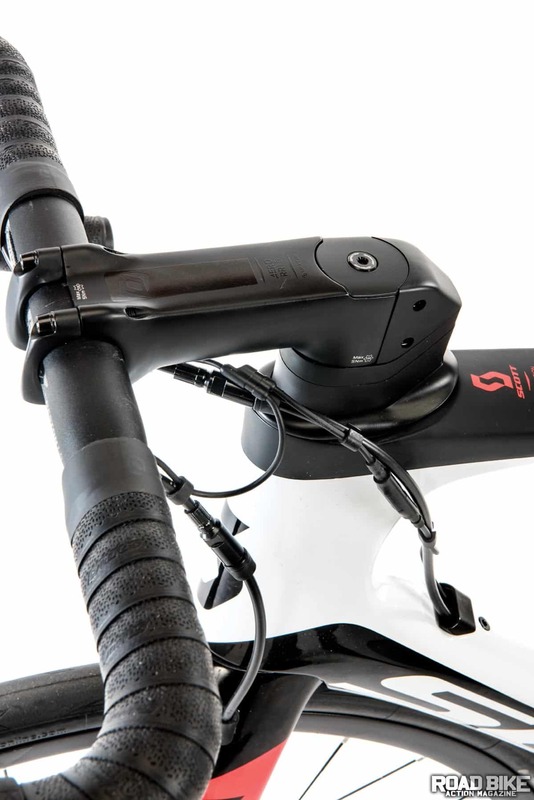 The integrated stem and internal cable routing adds to the Foil’s clean look and aerodynamic profile. To help make the Scott more vertically compliant, they lowered the point where the now smaller-diameter seatstays connect to the seat tube. The Foil also received a redesigned head tube with a tapered steerer tube and an increased bearing size compared to the original version. On the road, this translates to a stiffer front end with more precise steering. The Foil Disc is sold in three different levels, ranging in price from $3599 to a stratospheric $11,999. Our middle-of-the-line Foil 10 Disc has a retail price of $4699 and features an Ultegra Di2 22-speed drivetrain with a pair of Ultegra hydraulic disc brakes. Our size-54cm test bike came with 160mm rotors front and rear. The cockpit features an integrated handlebar and stem, which further adds to the Foil’s aerodynamic design. The rims are wider than the original Foil and are wrapped in 28mm Continental tires, whereas the original Foil was sold with 23mm tires. 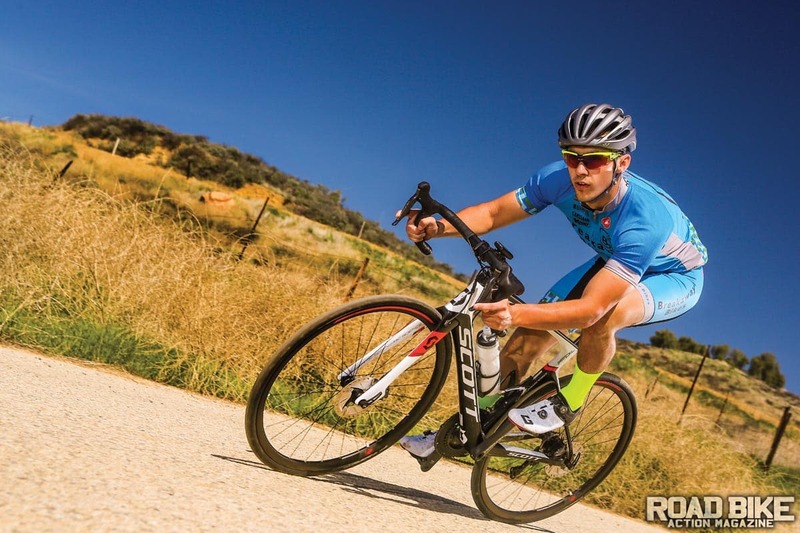 Despite adding weight, the disc brakes and wide tires are still the best improvements to the Scott Foil. The first time I threw a leg over the new Foil, I was pleasantly surprised to find that the bike hadn’t strayed too far from its roots it still likes to go fast. Along those lines, I was surprised to find that the new Foil weighed 1.7 pounds more than my old bike. The most obvious upgrade was the performance of the disc brakes that greatly increased the stopping power and modulation over the original rim brakes. Thanks to the new rear triangle and wide tires, I also found the ride was noticeably smoother. On the climbs I took full advantage of the 11-30 cassette and felt my power was transferred from my pedals to the ground well. Once my climbs had peaked and it was time to descend, I felt a wave of confidence I had never experience from my previous Foil. For anyone who doubts that bike design, technology and performance can’t change much in five years, I’ve got news for you—it has. Except for the weight, the new Foil Disc outdoes its predecessor in every way, which shouldn’t come as a huge surprise. 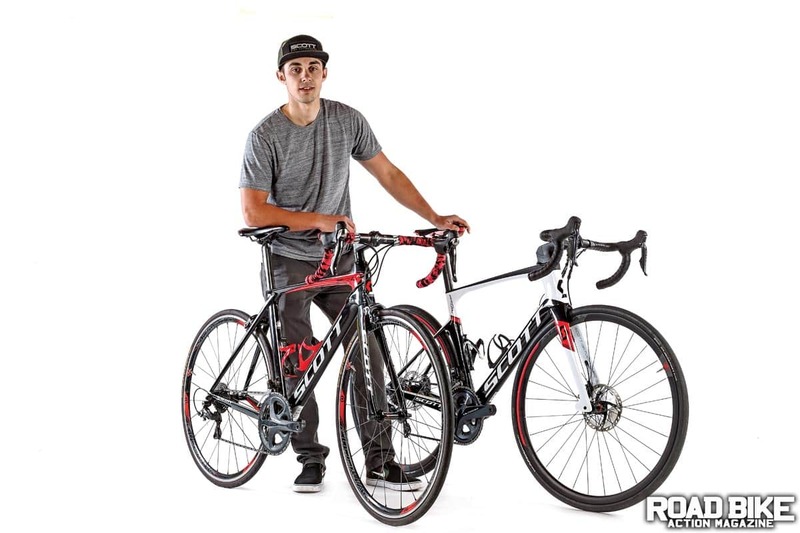 However, when riding these bikes back to back, it quickly becomes apparent how much innovation has gone into the Foil since its first production model. The ride is smoother over rough roads, more precise through the twisties, and the brakes deliver power unmatched in the rim brake world. 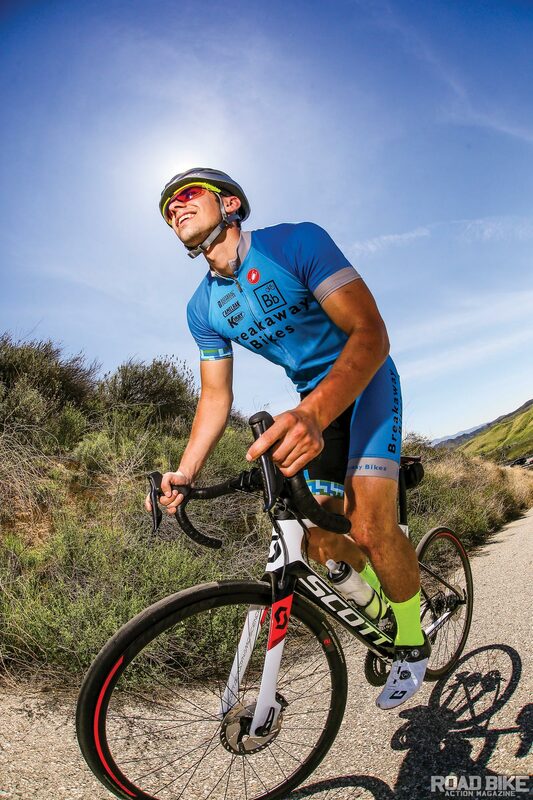 Due to its more compliant ride, the Foil should appeal as much to weekend warriors looking for some added speed just as much as it would to the professional racer.